Home › Animals › Fashion Conscious Bees Swarm Swedish H & M Store, Could They Have Picked A Worse Store? Fashion Conscious Bees Swarm Swedish H & M Store, Could They Have Picked A Worse Store? According to the Local, thousands of bees swarmed an H&M store in Stockholm, a city that happens to be the headquarters of the Swedish clothing company. The bees were removed by making them dizzy with smoke and good deals. As we originally wrote here, earlier this summer, 500,000 bees were shipped on a plane, not being flown by Samuel L. Jackson, from Sweden to Greenland. “Why is all of this critical environmental information?” you ask. 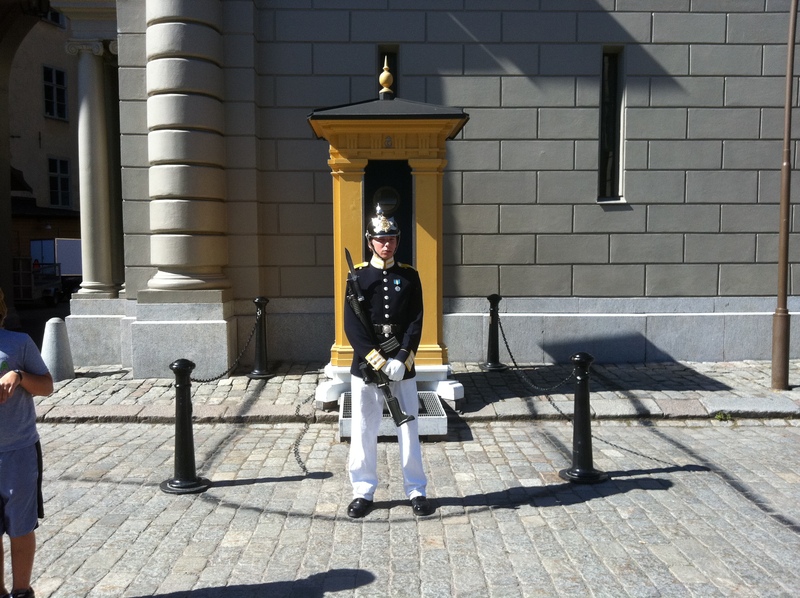 Does this Swedish Guard know where the bees are? 1. Build-A-Bear Workshop. If we learned anything from cartoons, bears love reaching into hives to get some honey! So, of course, swarms of bees want vengeance on any bear they can find. While Build-A-Bear is a store that let’s kids build stuffed toy bears to celebrate birthday parties, it’s not going to be a celebration when a swarm of bees wearing H&M polyester vests get stuffed into a bear by the brattiest kid. Trust us, when these bees look in the mirror and see a giant buzzing bear, it’s gonna be chaos, as the bees try to destroy themselves, but have trouble destroying anything made of polyester. 2. Hollister. Bees love a day at the beach! But this is one of those dimly lit beaches with attractive employees, and music with bass loud enough to drown out the most baritone of bee buzzing. Hardly the place for the I’m-So-Desperate-For-Attention-I-Have-To-Swarm-Stores-In-My-Thousand-Bee-Entourage crowd to get noticed. 3. The Gap. These bees must want to party like it’s 1999, if they’re heading over to the Gap to find a pair of khakis to wear to their new job at No-Business-Plan-Dot-Com.com. Although, if a swarm of bees flew into a cavernous Gap store in 2012, would anyone even notice? We’re guessing no, and we’ll put the Gap on the same list as Sweden as places for Ellen Page to start looking for all the world’s vanishing bees.